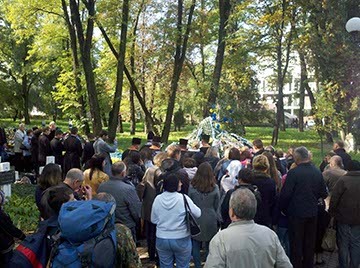 After joining the “small provisional community” in Kiev, a brother continued his stay in Ukraine by visits to several cities. 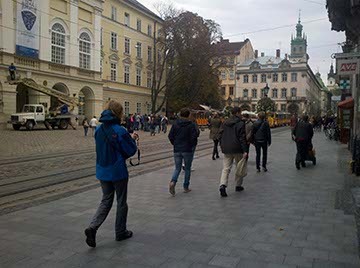 Time of prayer, meetings with youth, visits to two universities and a seminar, conversations with bishops: the program was varied, especially in order to understand the situation of the country better and to encourage young people attending the meetings in Taizé, Strasbourg and soon in Prague. Every day, I met many people, especially young people. I am also surprised to remember, for each city, the face of a child I met. What could be better than the faces of children to think about the future of a country and of a people and pray for them? Two days before my arrival, the statue of Lenin on a large square in the city had been pulled down. The students I met still couldn’t believe it. That evening, after the Eucharist celebrated by the Catholic bishop and the procession behind the cross of World Youth Day across the city, I spoke with several people, including a boy about ten years old. He was so happy to speak in French, using the few words he learned in class! His desire to overcome language barriers was evident; he beamed with joy. Upon leaving, he crossed the room once more to say "goodbye". How lucky to grow up with such an open heart! I was expected at the Orthodox Seminary of the Diocese of Poltava, located in the city of Komsomolsk. There I met and spoke for two hours with the students, a sign of trust on the part of the teachers. One of them is a young married man. The younger of his two sons, Constantine, was just two years old. What struck me in observing him was that he did not stop smiling at me the whole time we were together. Through this young child, who is separated from me by so much, it’s as if I received proof that the human family is one. After returning to the West of the country, I was expected for a meeting with students from the city of Rivne. The teacher who organized the meeting also introduced me to his family. Vika, his daughter, has not yet reached the age to take part in Taizé meetings. With her, I explored...her history book. It was exciting to turn the pages, especially to look at the pictures, to see her interest in explaining to me as best she could some of the events of her country’s past. As I was leaving, she had the idea of offering me another history book, from a previous school year. After a busy schedule in Lviv, the largest city in the West, we made an appointment with the young people for evening prayer in a church in the historic center. Before the prayer, we were together in the square outside the church when a young mother approached. We started talking on a bench in front of the church; she had just participated in the pilgrimage of trust meeting in Riga and hoped one day come to Taizé. I tried to talk with her son Taras, but it was not easy. He suffers from autism. But gradually, without speaking, he became very affectionate; we spent a long time together. She asked me to pray for her family and her son in particular. During the whole prayer, I would have his face in mind. I got to Ivano-Frankivsk on a special day without having known it ahead of time. A prayer and a concert in memory of a young man from the city, Roman Huryk, who died on February 20 after being shot by a sniper, were planned. In early October; he would have been twenty years old. 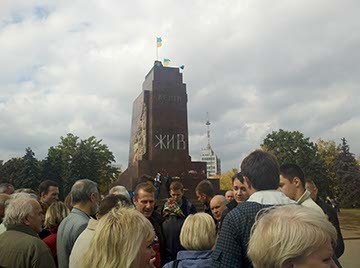 His family invited relatives of other victims of repression to visit their city in order to come together and to remember their missing relatives or children. Suddenly Roman’s grandfather, Pan Miroslav, was introduced to me. We got to know one another: he is himself involved in his parish; not without emotion we shared about the life and death of his grandson. In his turn, he introduced me to Roman’s mother and two little sisters. Through this meeting, news and echoes I received throughout last winter suddenly became so concrete, embodied in the pain and hope of a family. Thinking of Ukraine, hearing the news from that country, I now keep these faces in my mind. They encourage me to think that a future of peace and reconciliation is possible and necessary.